If you're interested in starting your Vegas experience off on the right foot, then head down to Fremont Street and head on up to the Slotzilla! 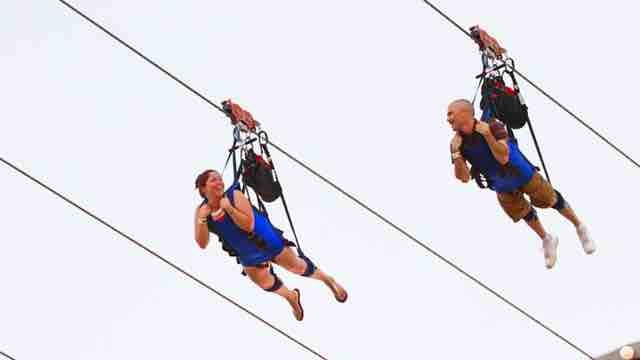 A 12-story, slot machine-inspired zip line attraction is one of the best activities in Las Vegas. Slotzilla offers two different options. There's a lower 'Zipline' and an upper 'Zoomline.' The Zipline costs $20 and is 77 feet off the ground. Once you're strapped in, you'll come to a stop halfway down the Fremont Street Experience pedestrian promenade, between the Four Queens and Fremont casinos. If you're ready for a more intense experience, try the Zoomline! The Zoomline takes off more than 10 stories up (114 feet) and whisks flyers 1,750 feet, all the way down the Fremont Street Experience, to a landing platform at the city's most historic casino, the historic Golden Gate. The Zoomline costs $40 and while there are some claims that you'll reach speeds up to 40 miles per hour, from most reviews, it's unlikely that you'll gather that much speed. Flyers must be between 60 and 300 pounds for the lower Zipline, and if your teenager is taller than 6'8", then they won't be able to take the lower line. For the higher and faster Zoomline, flyers must weigh between 100 and 300 pounds. One of the perks of the Zoomline is that you'll be flying prone, or 'superhero-style,' which allows for an unprecedented view of the Fremont Street Experience, as well as some hilarious pictures! We guarantee it's unlike anything you've ever done before, and are unlikely to ever forget!